This 30-day challenge has been specifically designed to get you your perfect body! Just keep doing the daily routines and you’ll see a HUGE difference by the end of only ONE MONTH!! Remember no pain, no gain, just keep at it. 1. 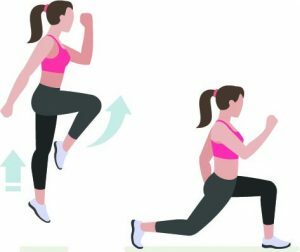 Simple cardio exercise great for getting your heart rate up. Sometimes known as star jumps! 2. Start standing up straight, with your hands and feet by your sides. 3. Jump into the air, moving your hands out straight to your sides and separating your feet putting you into a star position in the air. Land with your feet apart and your arms straight out to your sides. 4. 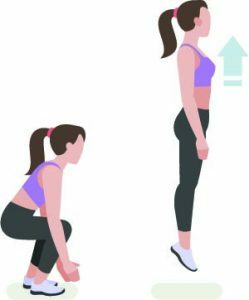 Jump again, reversing the motion, moving your arms back in to your sides and your feet together. This is one rep.
Whilst in the air, swap your legs over so you land into a lunge on your other foot. 5. Repeat with the other leg. Lie face down on a flat bench with your hips on the edge of the bench. Fully extend your legs and raise your feet up from the floor so that they are in line with your body. Place your arms on top of the bench, using them to hold on to the front edge of the bench for stability. Squeeze your glutes and hamstrings and straighten your legs until they are level with your hips. This is the start position. 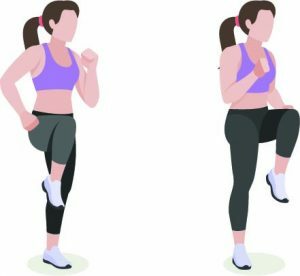 Start the exercise by raising your left leg higher than your right leg. Then lower the left leg as you lift the right leg and so on. Alternate in this manner until you have done all repetitions for each leg. Rotate your hips slowly to the right so the right hip faces the ceiling. At the same time lift your right arm, bending your elbow until hand is even with shoulder. Make sure your core is engaged to target the obliques. Return the right arm back to starting position and switch to the left. Squats are the key exercise for the squat challenge. They work your whole body, so getting the basics right is important for developing those curves! Slowly lower yourself down, bending your arms until your one or two inches above the ground. Make sure not to flare your elbows out too much. At most your elbows should be out at a 45-degree angle to your body.